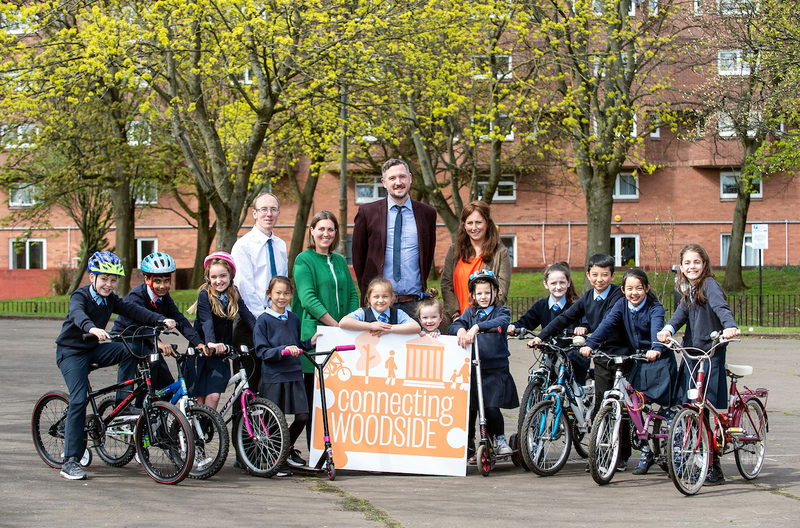 Following extensive community consultation, Glasgow City Council and Sustrans Scotland have announced that they have rebranded the Woodside Mini Holland active travel project as ‘Connecting Woodside’. The project, a winner of Sustrans Scotland’s 2017 Community Links PLUS (CLPLUS) design competition, will deliver world-class walking and cycling infrastructure throughout the Woodside community. Through its area-based approach, benefits to the community will include improved health, wellbeing and an enhanced environment. Pupils at St Joseph’s Primary School in Woodside contributed to the rebranding through submitting creative name suggestions which assisted in shaping the brand of Connecting Woodside. Staff and pupils were joined by Sustrans Scotland CLPLUS Project Co-ordinator, Marie Davis, and Glasgow City Council’s Convenor for Sustainability and Carbon Reduction, Anna Richardson, to announce the updated branding. The new identity reflects the aims of the project which is to connect Woodside to the wider city for sustainable travel as well as the Woodside community. This will be achieved through implementing an area-based approach to improve walking, cycling and public space. Sustrans Scotland Head of Project Delivery, Infrastructure, Matthew Macdonald said: “The new project name, Connecting Woodside, reflects the input and engagement of local Woodside residents and community groups. Connecting Woodside originally took inspiration from London’s Mini-Holland competition and transport infrastructure in the Netherlands. Part of the project will include a segregated cycle route along St George’s Road from Charing Cross to Possil Road and will connect to the Sauchiehall Street “Avenue” that is currently being delivered through the City Deal Regeneration. Councillor Anna Richardson, City Convener for Sustainability and Carbon Reduction at Glasgow City Council, said: “The pupils have played a key part in helping rename Connecting Woodside. It fits perfectly. This million pound development will connect Woodside to surrounding areas and beyond, making it safer and better for people walking and cycling. The proposal also includes the expansion of the cycle network into the city centre, St George’s Road, Woodlands Road, Garscube Road and the Forth and Clyde Canal in a bid to encourage cycling as the favoured commuter option. The project has the potential to provide a launch pad for a similar approach across Glasgow. In addition to the health and wellbeing benefits that the extensive cycle network will bring to the surrounding area, Connecting Woodside will strengthen local economies and improve road safety encouraging people to walk and cycle. Successful projects in the CLPLUS competition are funded by the Scottish Government, with local authorities match funding the grant. Connecting Woodside was awarded £7 million for the development of the programme over the next three years with Glasgow City Council providing a further £1 million in addition to city deal funding for Sauchiehall Street.